Beginning his career as a dental technician and working in that field for five years after graduating from the Dental Technology Program at Orange Coast College, Dr. McRae understands the intricacies of creating the best dental implant experience for his patients. His experience combining technology with esthetics in order to design the perfect crown, bridge, or denture has given him an exceptional level of expertise typically not held by professionals practicing cosmetic and implant dentistry. With more than 20 years of experience restoring dental implants, Dr. McRae has become an expert in this aspect of cosmetic and restorative dentistry. For the last five years, he has been placing dental implants in his Oceanside office and restoring chewing and bite functionality for his patients. In addition to standard dental implants, patients can request a consultation to discuss how their smile can be improved with mini dental implants or implant supported dentures. Dental implants are the preferred treatment for patients who have missing teeth, partly because it helps to maintain existing bone density in the jaw, and also because it offers a more permanent solution than either bridges or dentures. Additionally, no modifications need to be made to teeth adjacent to missing tooth space when dental implants are used to restore a patient’s smile. 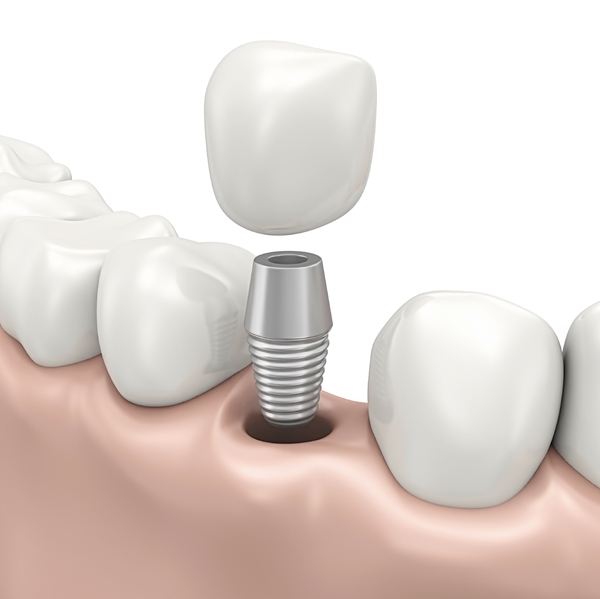 With dental implant treatments, patients regain the confidence they once had in their smiles. Most patients are back to work the same day with very little downtime, whether they are having the initial placement or the final visit. However, each patient is different and circumstances vary, so it is possible that more time off may be needed. We will provide you with complete post-op instructions and care recommendations to ensure you have a healthy, quality dental implant treatment. Several stages are involved during the dental implant process to restore your smile’s form and functionality. An initial consultation takes place to discuss the patient’s medical and dental history. Next, panoramic x-rays are taken to assist the dentist in forming the best treatment plan for the patient. Our Oceanside dentist will inform you if you have any existing oral health care concerns or conditions that might influence treatment options. Following your dentist’s instructions prior to and after your dental implant surgeries will lead to faster healing with less likelihood of problematic issues arising. You should receive both oral and written instructions to follow, but here are a few of the highlights. Smoking should be avoided since it slows regeneration and healing. Physical activity should be limited since overexertion can cause bleeding to start up again. Patients should continue to take prescribed medication prior to the dental implant surgery, but should avoid all other OTC medications. Seeded foods, hot foods, and crunchy foods should be avoided until after your wounds heal. You can brush and floss your teeth twelve hours after your surgery, but you should take special care to avoid the wound site to keep from disrupting your sutures. Questions? Interested in a dental implant consultation in Oceanside? Please contact us if you would like to learn more about dental implants and how they can restore your smile. If you have questions for your Oceanside dental implant dentist, or if you would like to request a consultation to find out if you’re a good candidate for dental implants, give us a call today.